American businessman, philanthropist, former United States Ambassador to Denmark and Delegate to the United Nations. 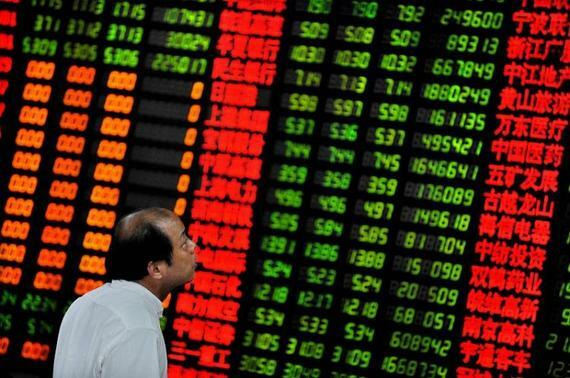 Why would the Chinese government pump up its stock market to retail investors? Short answer -- to create a middle class wealth effect and boost the chance for highly indebted companies to refund borrowings through equity issuance. And maybe to invite in some foreign investors at long last. Never airbrush the Communist Party out of the Chinese markets -- for all of the freeing up of individual access there remains an abiding faith in Beijing's ability to provide a soft landing. And state-owned media's urging of its citizens to invest took hold. The Shanghai Stock Market only opened for trading in 1990. For the last six years the Index has been rolling along like a flat prairie decoupled from the steady economic growth of China -- making it one of the worst performing markets in the world year after year. Then in June 2014, levitation began and the market surged by over 160 percent so that the combined stock markets in China were the world's third largest behind the US Nasdaq. But there was a difference or two in China. First only 2 percent of the holdings were by foreigners. And unlike the United States and European bourses where big institutions dominate, individual investors play a huge role in China's stock markets. We are talking retail investors -- over 90 million accounts, and until recently growing rapidly. Fully 20 percent of those accounts signed up since May. To put that number into context there are not 90 million members of the Communist Party in China. We are talking an investor cohort way beyond the educated and elite business class. The ranks of China's investors are deep into the middle class. One study says 30 percent of college students are stock market players. Many had never invested until now. It gets worse. Margin debt by some measures is the highest proportion of any stock market in history. Margin loans to buy stocks surged 400 percent in the last year. When you consider that 12 million accounts were opened in May alone, it means that millions of Chinese middle-class investors were buying and borrowing heavily just before the peak. Put another way a huge portion of the $3 trillion in lost market value was in fact borrowed money by middle class Chinese. These days stocks get frozen after they decline by 10 percent and cannot be traded. But heavily leverage middle class members need cash to pay back loans--so assets of every kind, especially commodities are facing price decreases as desperate borrowers seek a way to raise money. What is interesting in contrast to the U.S. response of 2008 is that China is moving every muscle to try and wrestle the middle class investor to a place of calm and restored order. Investors come first, banks and brokerages second -- an interesting turn on the market's social compact. But markets cannot be controlled, even by a super potent regime prepared to do almost anything to prevent social unrest among its burgeoning investor class. The Party apparatus is cloaked in immense power and it would be a mistake to use western yardsticks to determine how far China will go to protect its shareholders. Watch how the Chinese government and the Peoples Bank of China (PBOC) maneuver to protect these investors. Sadly they cannot put a Nerf Ball under every individual account. Lowering interest rates multiple times, pressuring brokerage firms to spend billions to reduce downward price pressure, curbing speculative IPO's and good old fashion "Let's Not Panic" jawboning will not restore confidence. But expect tens of billions of repurchases at the behest of state run brokerage firms. A teacup against the tide perhaps -- but the signaling power is strong -- just like the state's ominous warning to punish with a "big fist" anyone caught manipulating or aggressively driving the market south. China can halt the march of nearly a thousand companies hoping to tap the once robust equity markets with initial public offerings. It can freeze trading in most listed shares. And it can roll over margin loans when maturities intrude on the lives of their investors. For their part Chinese shareholders are liquidating what they can to mollify creditors. And if China freezes out negative influences... well we should evaluate the outcomes with a different lens. For all our crowing many moves by the state mirror what we did as 2008 reared its ugly head (remember when financial services stocks could not be sold short?). But none of these moves will succeed until two more things happen. Beijing must instill a deeply held confidence in these investors that the government will do anything to prop them up. Thus far, those stocks that can trade are rebounding generally. But half-closed markets are an imperfect measure. And second, Chinese investors must capitulate. Heavily leveraged middle-class Chinese will need to feel pain of their overextension. Until that sense of balance between borrowing and asset values is restored to individuals their market will be volatile -- particularly because there are far fewer alternative purchasers consistent with mature markets of the West. No hedge funds to the "rescue". No amount of party persuasion can restore confidence like the bottoming price action of a flagging bear run -- and that has yet to occur. Chinese investors need a cleansing. That only comes when values become attractive again at lower levels. That is the first step to restored order. It may well be that the Chinese stock market begins to reflect the individual economics of the Chinese middle class more closely than it has in the past. But China itself has weathered many threats during the nearly 30 years it has been a modern economic force of nature. Never count it out. True, its total debt is now considered more than twice its GDP -- an atmospheric height. But so many of the growth and vital signs as the nation transitions from a manufacturing export monster to a service and software oriented economy are still present. Many major western brokerages are maintaining a positive outlook on China's shares over the long term. Others are saying to outright buy on this weakness. The Hang Seng, which is the Hong Kong market, has been more muted on the surge up and more measured on the slide down too. But market malaise has a tendency to remain discreet for only so long before under-performance leeches into adjacent stock markets. And the Hang Seng has been under pressure before the last few days of breathing room. Here at home watch for major western corporates with major interests in the well-being of the Chinese middle class to suffer temporary setbacks. They too provide opportunity for those with the long view. Make no mistake, China is transitioning in two powerful ways and it is well along that path. Expect the country to do anything possible to prevent the stock market from impeding their progress. China's middle class will rise, supported heavily by the central government, and the steady, swift and sure shift to a service economy will mark a new path for China in the years to come aimed directly at our middle class. And when the economic outlook and the stock market again converge it will mean higher prices than today's crumbling action and uncertain attempts to rebound. The choice for us is whether their middle class surge is opportunity or threat. Of course, it is both.